Barbara grew up in a small Louisiana town and attended college in Houston where she met her husband, Chuck. After receiving a degree in English and History, she taught in the Houston Public School System for ten years. In the mid-eighties, they moved to New York City where she pursued a life-long interest in fashion at Bergdorf Goodman. 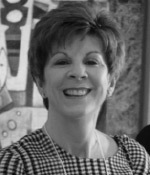 In 1999, she was awarded the Bergdorf Goodman Chairman’s Club Award for “excellence and exceeding expectations in customer relations and service.” While in New York City she was also instrumental in the formation of Moore Horizons, a commercial real estate consulting company specializing in mitigating investment risk on large commercial office buildings in the United States. She is a part owner of the company. After visiting in the summer months for several years, a permanent move was made to Santa Fe in 2009. In her desire to contribute to the community, Barbara has become actively involved with the Santa Fe Opera, SITE Santa Fe and, most recently, NDI-NM. Barbara is an avid reader with a passion for music, art, and architecture.